Jason and I set aside last night as date night. Over the last few weeks, I’ve had some time off, and have put a lot more time into my website and Instagram: you can see I’ve added a drop down menu of restaurant listings by borough with my ratings, and I’ve been getting some other “behind the scenes” work and research done, too. After compiling my lists, I started to feel really bad for Brooklyn. 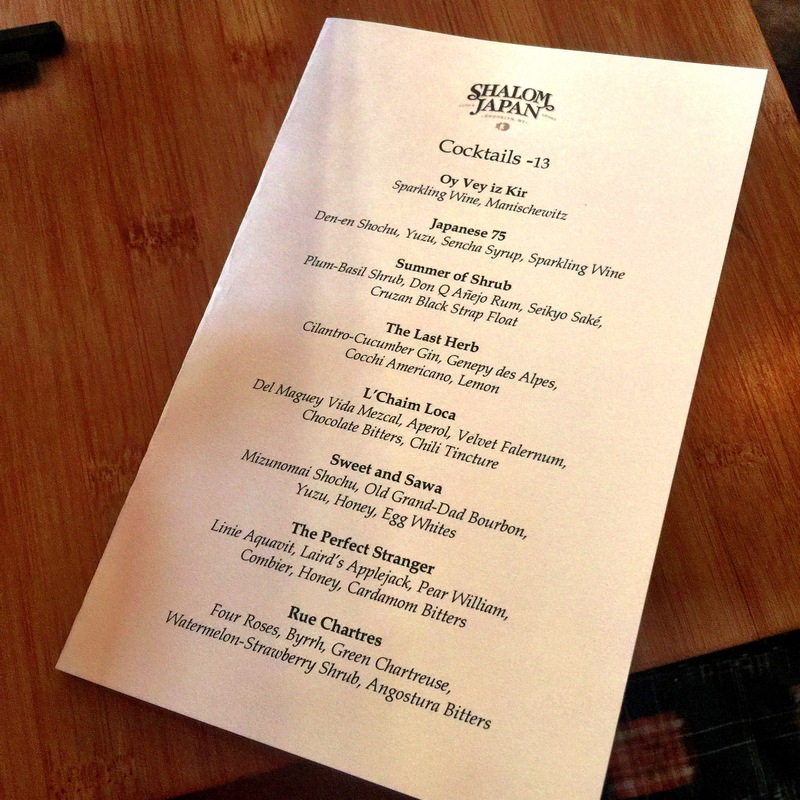 It’s one of my favorite boroughs, especially to eat and drink in, and my list of reviewed restaurants there is so small. I’m trying to find some new places to write about that aren’t already the most trendy or famed names. So as I passed by some of those big names on Yelp, I found myself slowing down at Shalom Japan… interesting. I set up a 6:00 reservation, and emailed the management (you know, my new thing) to let them know that I’d be coming and to ask if there were any special off-the menu items, or recommendations for us to try. The restaurant manager, Thierry Morpurgo, did take the time to write a quick note back suggesting we go with the Omakase menu ($65 per person). Such a simple gesture of being responsive goes such a long way. Obviously we arrived a half hour early at 5:30 (because we’re psychos), just as the restaurant was opening, so we had it all to ourselves. The space is nice: small, quaint, very hipster, with touches of both Asian and Jewish influences throughout. The bar was well stocked with some very interesting options, including several Japanese whiskies. Unfortunately, Jason was driving so none of those made it to our table, this time. To start, Jason went with a Rue Chartres (we believe that Four Roses is a good start for any cocktail) and I the Sweet and Sawa (you know me and my egg whites). Jason’s was basically a lighter and sweeter version of an Old Fashioned – a summery take on the classic (citrusy and fruity), which probably appeals to a much bigger audience, but was just a touch too sweet for our taste. 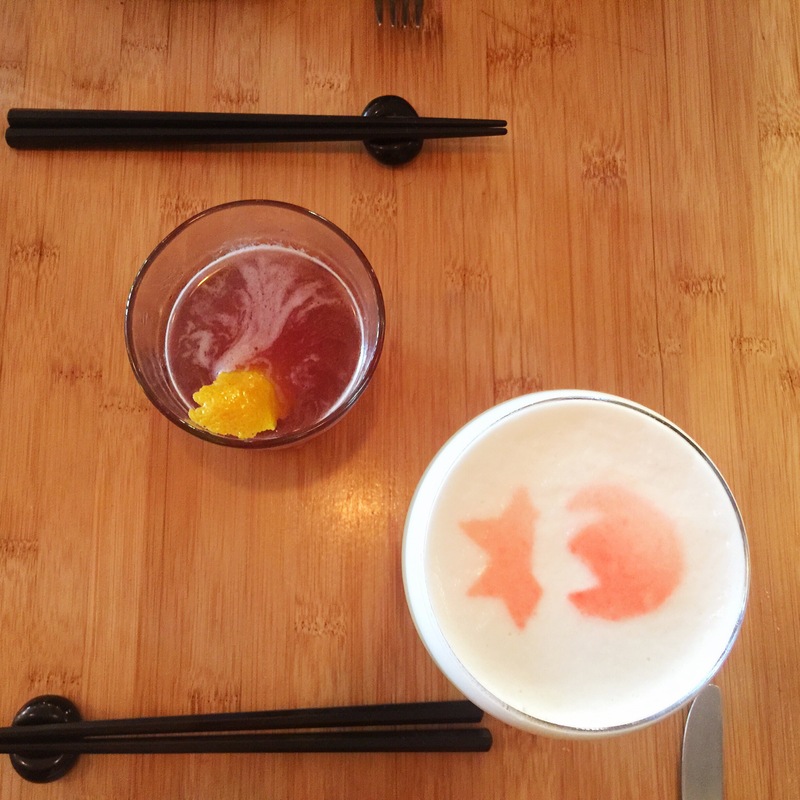 My Sweet and Sawa was exactly as the name implied: a nice balance of sweet and sour (like most egg white concoctions); the presentation was pretty, and the punch of the drink was very mild… not strong at all, but sometimes that’s a good thing. 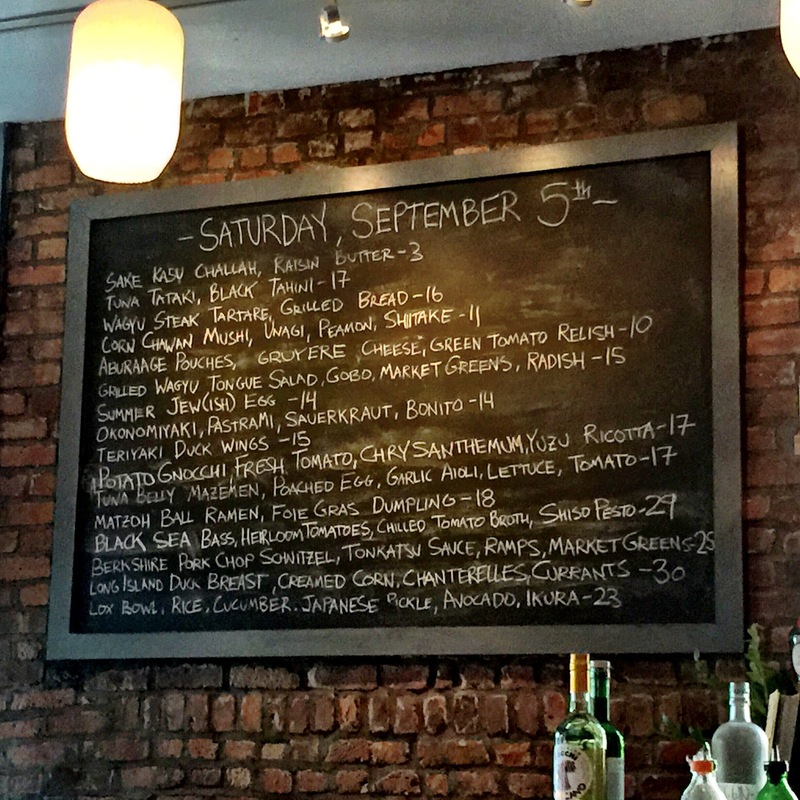 We came to the menu, written on a chalk board that was centrally located near the entrance. There were a few things that you can probably guess (wagyu tongue, foie gras dumplings, jew egg) struck my interest, but I was also hoping to take Thierry’s suggestion of the Omakase menu. Our waiter was good; he made no mistakes, gave suggestions when asked, and was attentive thoughout the meal. But he was subdued and mellow and I wish we saw a little bit more personality from him. I want my waiter to be as excited about the food as I am; although I get really excited about food, so maybe that’s unrealistic? The staff seemed a little disjointed and confused at times throughout the meal, too: bringing us small plates, and then taking them away or bringing us steak knives and then taking them away to double check that it was the right time to do so, and then bringing them back. To me, those little things don’t matter much at all; they don’t impact the food, and maybe it was the bus staff’s first day… everyone needs a chance to learn. But to some, I guess it could have been annoying. Our meal began, and we were first brought the challah bread with raisin butter. The bread itself was visually gorgeous, perfectly toasty on the outside and then fresh, flakey, and smoking hot on the inside, as we tore it apart like the ravenous cavemen eaters that we are. The butter was sweet and fluffy and was a nice light way to start the meal. Our first course of the six was up, and this was one of our absolute favorite courses of the meal: the corn duo. On the left of the picture above was part one, a street corn with a nice crumbly cheese, mayo, chives, and lime. It was cut into little quadrants, which was easier to eat than the typical full ear of corn. This is something not on their regular menu. Nice flavors, basically a perfectly done Mexican street corn. That little cup on the right, however, was a cup of magic. This was the Corn Chawan Mushi from their regular menu, and is an absolute must try if you get to this restaurant. It was like a little cup of smokey corn custardy chowder, with a sweet almost like a brûlée on top, and two chunks of eel. Usually something this gelatinous would freak me out – I have a long standing fear of jello (seriously, nothing should jiggle like that on its own) – but this was so full of flavor and textures that I overcame my fears. There were chunks of corn on the bottom, shitake mushrooms thinly slivered throughout, and the amazing Unagi (eel) that gave it almost a dessert quality sweetness on top. Obsessed with this. They should force people to try this dish. I think it was around here that we had finished our cocktails and switched to a bottle of wine: we did the $56 Shinn Estate Vineyards Merlot, 2011 – it was very, very good. Although I recently watched the Netflix documentary Somm, I still have no idea how to explain wine. To me, it’s always either good or very, very good, and this was definitely one of my favorites. The salad was a total bummer; I was mad at myself for insisting on this dish, but I guess happy that I tried it. 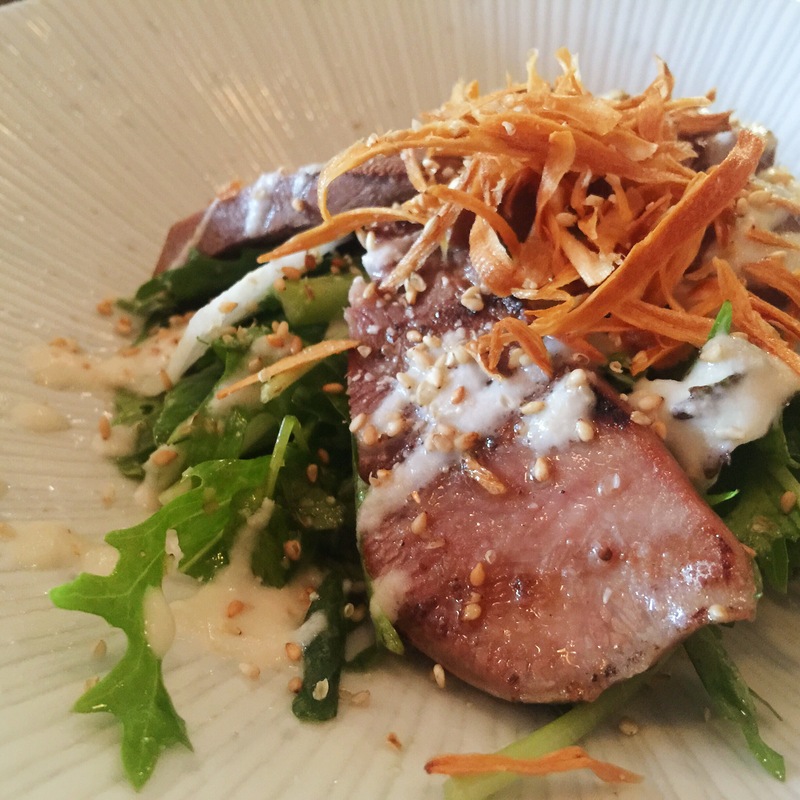 I’ve tried tongue before, but I don’t think I’ve ever had it as the focal point of a dish. It was wildly salty, and I don’t say that often – I prefer my food over salted, but I think most people would find the salt content here inedible. The meat itself was cut thicker than I’d expected, and was tough to chew through. I literally felt like I was making out with a cow, with its weird rough tongue on mine (gross, I know). And then there was this kind of fibrous band around the edge of it – not sure if that’s just natural or the result of the cooking technique? I am by no means an expert on tongues, so I’m not sure what went wrong here. But I do think a thinner cut – more like a shaved tongue – with a lot less salt would have tenderized a lot better, been easier to eat, and been much more appealing, in general. 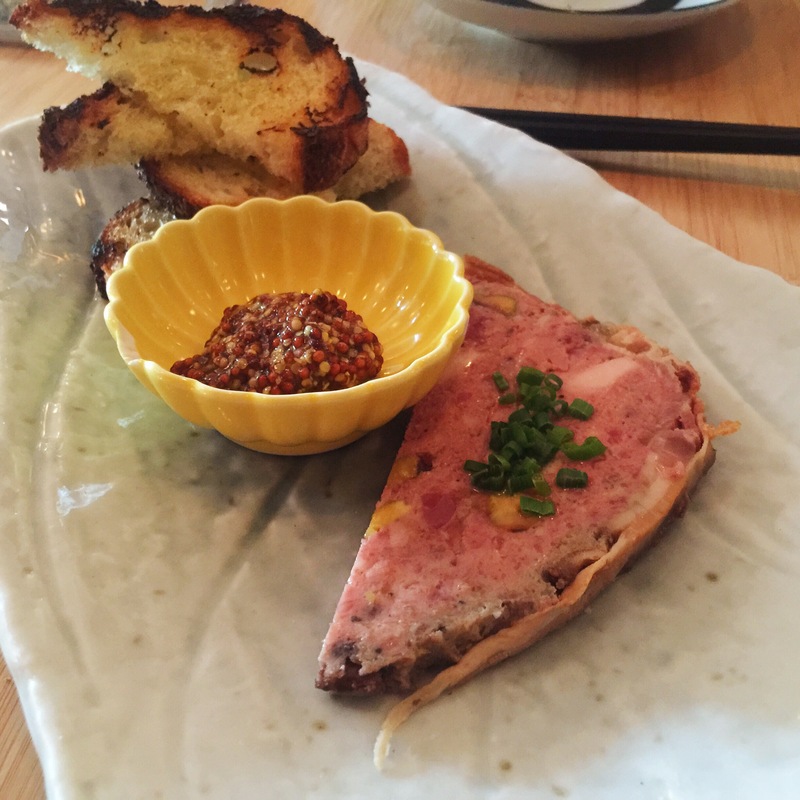 The Guinea hen terrine was good, another item not on the regular menu. The meat itself was very fatty; it reminded me both taste and texture-wise of liverwurst which isn’t necessarily a bad thing, but I was surprised by it. I put my first taste on the bread with the mustard, and while it was good, I lost the flavor of the terrine. So I ate my next bite just by itself with a touch of mustard, and much preferred it that way. Nothing crazy, but this was a well done terrine. Thierry Morpurgo (my new manager friend) served us our third course, the summer Jew egg – and did so with much more excitement than our waiter; I was happy to see management’s passion for the food. 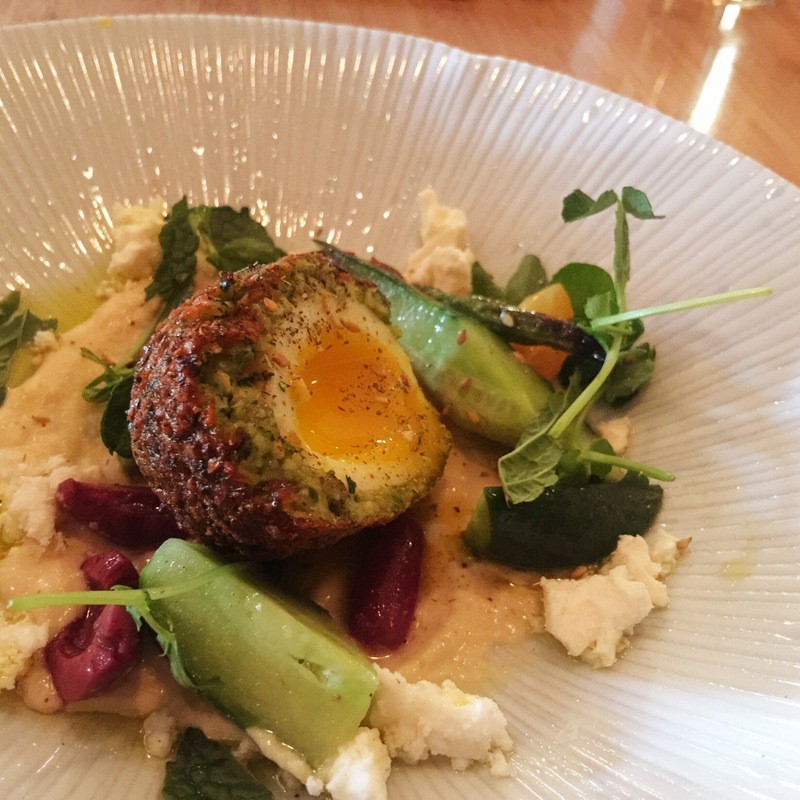 I asked if there was a Jew egg for all seasons, as it seemed like an obvious question, and he informed me that, “There was actually a spring egg, with kind of a pea puree, but I think this one is better.” Jason loved this dish, a huge fan of anything falafel. I thought it was good, done well and a smart concept, but I felt that there was too much going on. The egg itself was cooked absolutely perfectly, the yolk runny but set just enough to stay in place. The falafel was great, full of all of the right falafely flavors. And the hummus it sat on was fresh and garlicky (yum). The feta cheese, cucumber, kalamata olives, mint, and tomatoes all added nice color to the dish and looked great, but were overkill for me… it started to feel like an egg-ed falafel gyro. 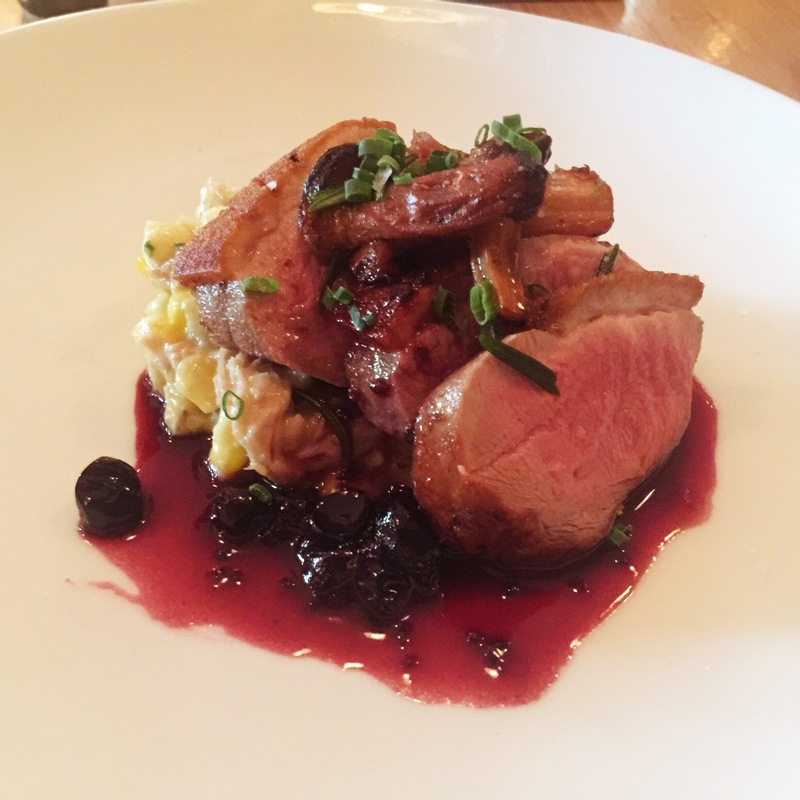 Our fourth course was the Long Island duck breast with creamed corn, chantarelles, and currant. This, like the corn chawan, was another A+ impressive dish. The duck itself was cooked exquisitely: rare, and tender, and even with a nice super crispy skin. The creamed corn was outrageous, with shredded pork hidden in it for a really awesome and different flavor. The currants were sweet and the chantarelles gave it some earthiness. This was a really well balanced dish. One complaint, however, was that Jason’s corn had barely any shredded pork in it, while mine was full; I had to scoop him some of mine. I think the porky flavor was what really made that component of the dish stand out, and had definitely been cooked into the corn anyways, but it was just slightly inconsistent. 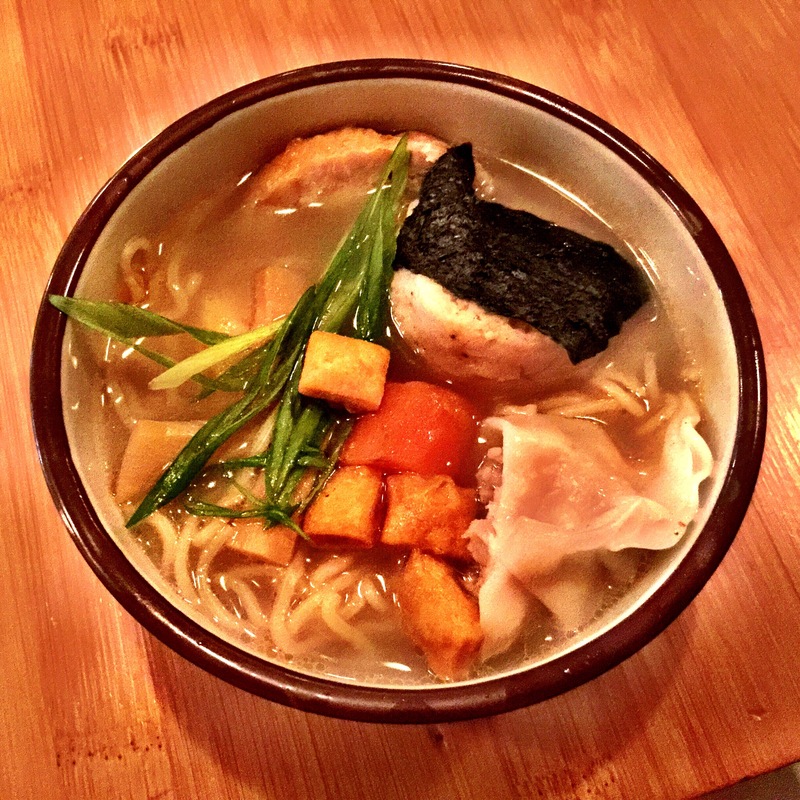 Course five was the matzoh ball ramen. It was good, typical ramen. The matzoh was the typical bland mushy ball that I always imagine it to be. And the foie gras dumpling… but wait, did they really only give us each half of a dumpling? I’m pretty sure the foie inside was lost in the broth of the rest of the dish, which was a shame, being it was the part I was most intrigued by. I hate to go here, but I think it’s time for a good Jew joke: did you guys really just Jew me out of a full dumpling? (Don’t be so sensitive, people… I love my Jews, but this was just too easy). All jokes aside, it was a good dish, and I realize it is probably not one typically put on the Omakaze menu for sharing. I just wish that that had either been explained to us, or that the dumpling foie leak would have been more thought out. Course six was dessert: we were brought the cherry blossom panna cotta, and the chocolate banana challah bread pudding. 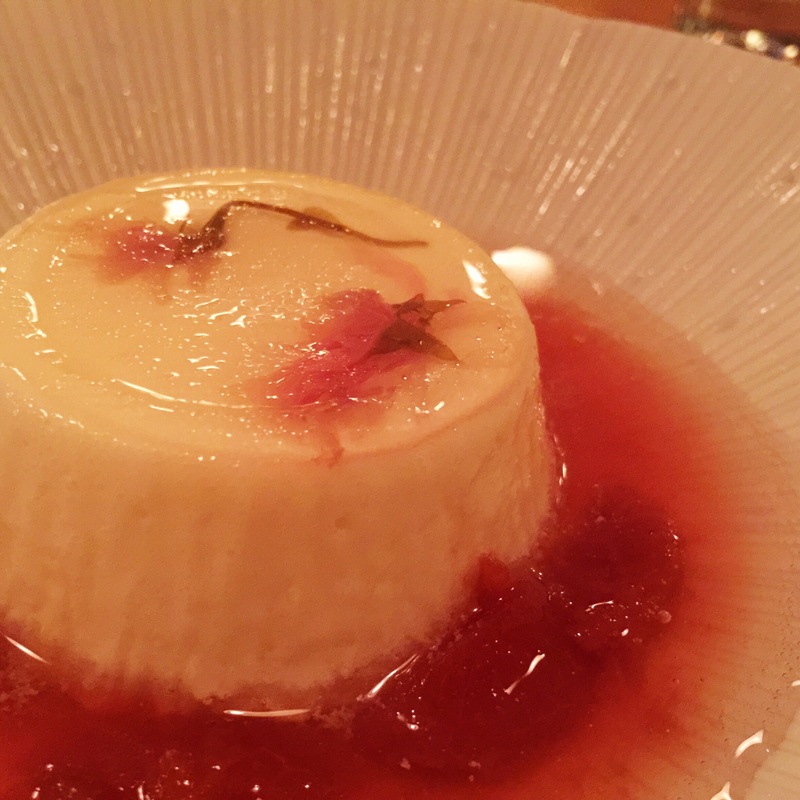 The panna cotta was very good: they poured some kind of sparkling wine or soda on top of it (that’s whats making that watery appearance around the edges), which was a cool fizzy touch to the smooth creamy dessert. This was very well done. 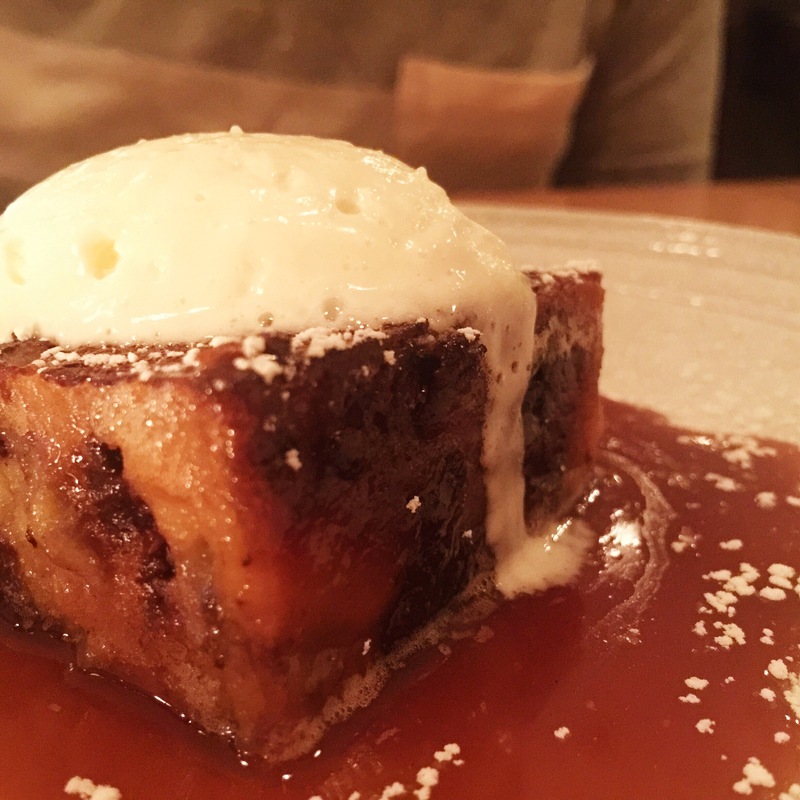 But the stand out dessert was the bread pudding. Served on a bed of amazing caramel, with what tasted like already caramelized bananas inside, super dark delicious chocolate, and wonderful fresh cream on top, this was a great final bite to end the meal. All in all, Jason and I had a great time, and we think there is a really cool concept behind Shalom Japan. 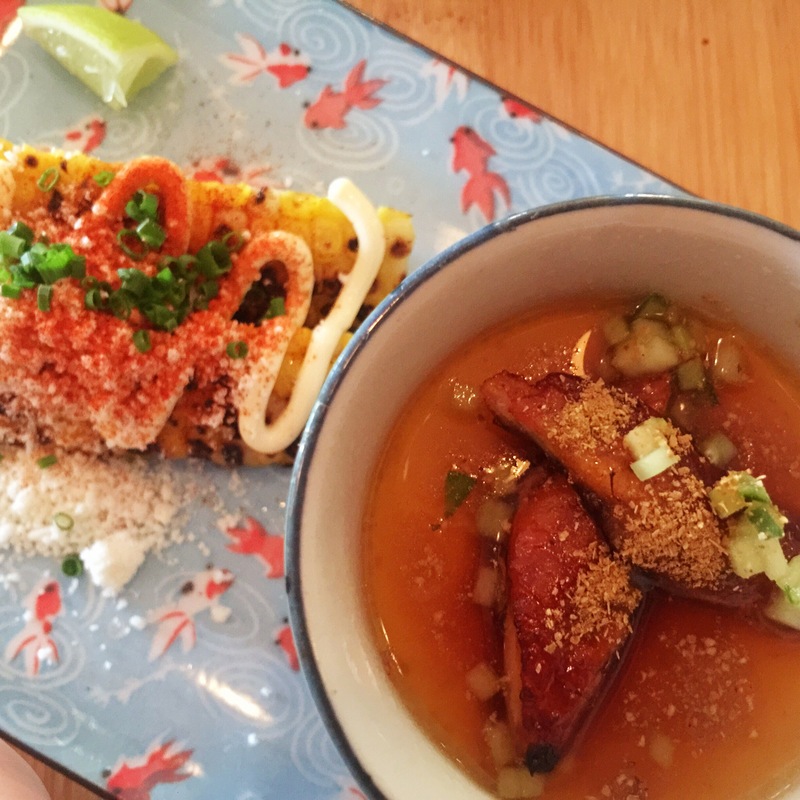 The stand outs of the meal were the bread, the corn chawan, the duck, and the bread pudding. The flops were the tongue salad, the ramen, and (for me at least) the egg – yeah, that’s all three of the dishes I insisted on having… fail. 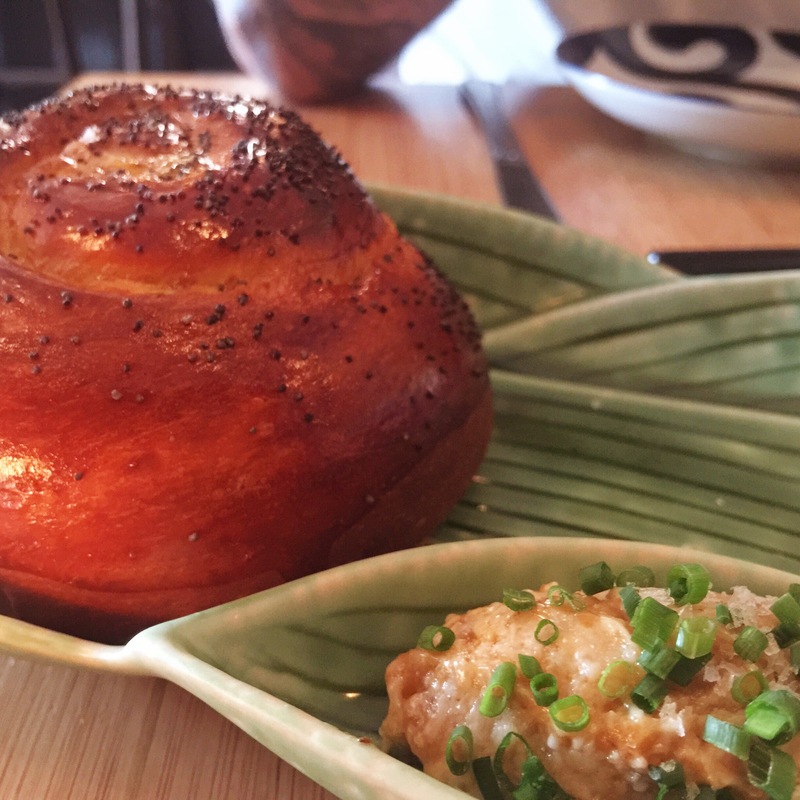 While Shalom Japan danced along a four star rating with some of those really awesome dishes, they were brought down to a three with some of the other issues we came across. I think this is an interesting restaurant that people should definitely try out, if they’re up for something a little wacky. I would personally be curious to come back in a few months, maybe when the menu is switched up a bit, and give them another try, as their errors were small and, I think, easy to make adjustments on. Overall, well done, Shalom Japan; I hope we meet again!